Over the past 20 years Convenience Services Ltd has been a leading player in the portable toilet industry offering interiors of a standard to be expected in a 5-star hotel.Take a look at some of our pictures in our Photo Gallery and if you’d like us to design a bespoke portable toilet and/or shower building, contact us on 0845 006 0737. 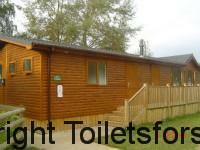 Cedar or log cabin effect exterior finishes. Full length partitions to all cubicles with oak finish doors. Oak finish wall skirtings, dado rails and ceiling trims. Concealed plumbing and cisterns with handbag shelves in all ladies cubicles. Percussion taps to all sinks with timed flow controls. Designer style vanity tops surrounding sinks with oak finish base and marble effect tops. Sensored external and internal light and extractor fans as required. Pitched roof if required with tile effect finish. 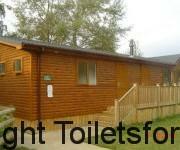 Contact us on 0845 006 0737 for a no obligation discussion and quotation estimate for the style of Toilet Block you have in mind.